07 = 1" with . Mount fixture to the machine with three screws and three washers, M6 or 1/4". Slide the encoder onto the shaft. With the setscrews, tighten the hollow shaft encoder onto the shaft with a minimum clearance of 1/16" between fixture and encoder. This assembly allows the shaft to float and increases the lifetime of the bearings. Connect the encoder as per wiring specifications. Make sure power supply is within the proper voltage and current rating. 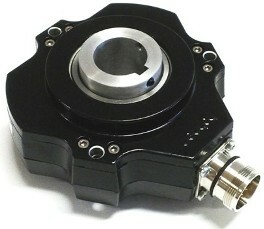 Encoder can be mounted with the setscrew on the machine side or on the opposite side for either CW or CCW. See datasheet for CW and CCW directions of the outputs.